As Christmas is fast approaching, it is obvious for the kids to wait for Father Christmas to come around and give the gifts they always wished for. For parents it is an increasingly challenging task to fulfil the wishes of the child and also stay within their affordable budget. Here are a few ideas that can entertain the kids and also does not dig a deep hole in your pocket. The Tether Ball System is a very versatile game for children as it has a super soft ball , perfectly suitable for kids and newbies yet strong enough for children to drain down on their adrenaline while playing. Since it is rust proof it is suitable for all kinds of weather and its sturdiness gives it an extra advantage for playing on absolutely any kind of surface. It also comes with a 5 year manufacturers warranty for a complete peace of mind. It is a very creative and challenging lego for children with some very interesting features like brick-built entrance doors, sign frontage, concession stand, ticket area, big screen, projector and reclining seats for 6 minifigures. This successfully replicates the real cinema that gives a great user experience for kids. vehicles include classic-style limousine hard to find elements include a red baseplate and dark tan dark red and gold pieces. This is going to be a perfect gift for a girl who dreams to have a house of her own. The 14 pieces of furniture, including a grand piano and a hanging plant gives the home decor a finest finish. Gliding elevator takes dolls to the first, second or third floor. It is made of composite wood products for long lasting. It can accommodate any Barbie sized doll. A step by step assembly instruction packaged with the product makes it easy to put together. It is large enough for many children to play together. The piano plays music, toilet makes flushing sound, and the lamp lights up to give it a real feel. This elaborate detailed doll house gives a royal finnesse for this masterpiece. The heart-shaped latticework, hanging chandelier, wide windows let kids see their dolls from different angles. New gliding elevator design helps kids to move between floors. It includes 16 colourful pieces of furniture and also a hanging chandelier. Its smart, sturdy construction made of wood gives it a long shelf life. It can accommodate any Barbie sized dolls and comes with a step by step assembly instructions and securely packaged for transportation. One of the most favourite outdoor game for kids is the bouncy castle. This large, 7-foot comfortly padded arena bouncer, and slide to exit off is a blessing for both parents and kids as kids jump off to glory and parents have the satisfaction of seeing them play in a safe environment. It has a arched canopy that provides constant shade even during harsh sunshine. Three mesh slides protect children, and let parents watch the fun. Stakes anchor the bouncer firmly in place, while a heavy-duty blower provides continuous airflow for the bouncer to remain in shape. It is built from puncture-resistant material and can guarantee non stop fun without any hazards. This Lego Mindstorms is an Intelligent bit of play toy that has a EV3 Brick with powerful ARM9 processor at the core, USB port for WiFi and Internet connectivity, Micro SD card reader, back-lit buttons and 4 motor ports. It includes 3 interactive servo motors, a remote control, new and improved colour sensor, redesigned touch sensor, infrared sensor and 550+ LEGO® Technic elements. You can control your robot via the infrared sensor system; Intuitive software (PC and Mac) with icon-based drag-and-drop programming interface. You can build and program your own robots on the go with the intuitive EV3 Programmer App available for iOS and Android tablet devices. Building instructions for 5 robots are included. Download bonus building instructions developed by real fans and endorsed by LEGO at LEGO.com/MINDSTORMS. Please get your parents' or guardians' permission before going online for your own safety. This story is taken straight from the Death Star escape scene of Episode IV: A New Hope. It includes 6 mini-figures of Han Solo, Luke Skywalker, Chewbacca, Ben Kenobi, Princess Leia Organa and Darth Vader. Millennium Falcon features opening hull, detailed interior, twin flick missiles, rotating laser cannons and detachable cockpit cover.3 lightsabers, 3 blasters and 1 crossbow. It has a total of 1254 pieces. 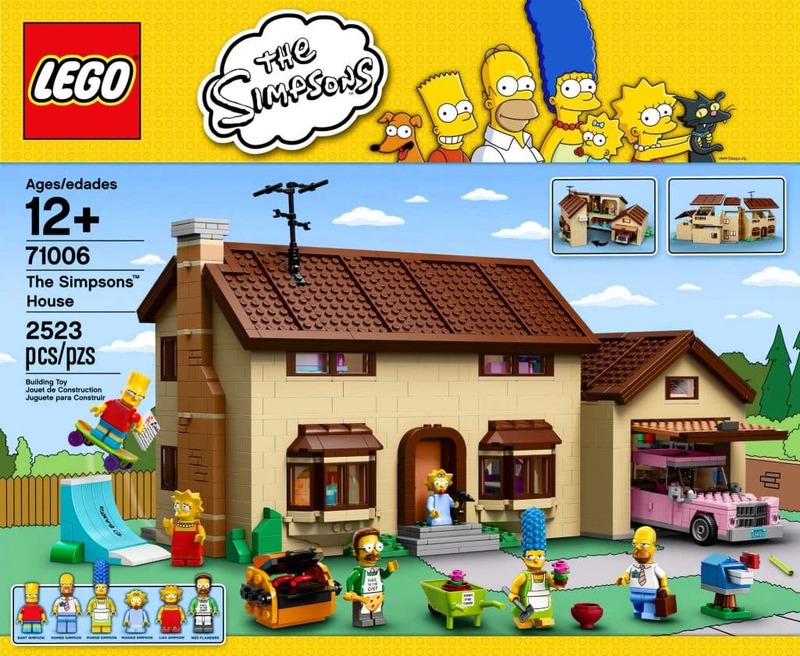 If you are a fan of Simpsons house and want to build it from lego, here is the perfect gift of LEGO brick building set of The Simpsons! It includes 6 mini figures of Homer, Marge, Bart, Lisa, Maggie and Ned Flanders. By removing the roof and top floor you can access different rooms inside. The house is hinged in the middle for easy access. The Simpsons House itself measures over 9" high, 16" wide and 9" deep. All in all a good value for money. if you are after a garden play tool or one that you can take for camping or picnics, this is definitely the one you should look for. It has a rugged 10” air tires for a smooth ride on any terrain. The all-steel seamless body with no-scratch edges and wooden stake sides makes it very sturdy and provides a perfect balance it needs. The extra-long handle folds under for easy storage. The controlled turning radius prevents children from overdoing the turn and tipping. The very design of the wagon helps handle on and off-road adventure. An absolute fun for role play of Barbie characters is what every girl longs for. The characters are soo deeply appreciated that, Barbie has presented the little girls with this new Dreamhouse as a token of gratitude. You can hit the kitchen on the first floor to create an amazing meal with the luxe stainless steel appliances and light-up oven. Barbie and her friends can use the spacious bathroom that feature kid-activated lighted mirror, a toilet that makes a flushing sound and someone singing in the shower to add to the effect of the play. Take the elevator to the third floor for even more fun. Girls will enjoy having role-playing adventures with Barbie and her friends in her new Dream House. Have fun! The Ultimate adventures a child looks for in a tablet can be experienced with LeapPad Ultra XDi's huge 7" hi-res screen. The winning feature of this little marvel is kid-safe web and kid-tough design. The huge, vivid screen delivers rich, dynamic graphics that immerse kids into the learning experience and bring the fun to life! There is access to most engaging learning library for kids, with 1,000+ educator-approved games, apps, eBooks, videos, music and more. It comes with 11 useful apps such as Photo Fun Ultra, Art Studio Ultra, Pet Pad Party, Utility Suite, Pet Chat and more. Other features included are rechargeable battery, Wi-Fi, 8GB memory, parent controls, two cameras and video recorders, MP3 player and more. Children over 3 years can use them. But Adult supervision is always recommended. A Top Fun styling ride on t﻿﻿oy, which runs on tracks and off track too is a great piece of entertainment. It also says Thomas phrases and sounds and has toddler-friendly features. An convenient push button operation for easy stop and go motion. It can be used both indoor and outdoor. A maximum speed of Up to 1 mph on track and up to 2mph off track is achievable. You need to charge for at least 18 hrs before first use, using the Power Wheels charger. This is a massive piece of kitchen where many children can play at the same time. It encourages children to play in groups and enjoy a family atmosphere even while playing. It exactly mirrors the real kitchen with all the appliances at their disposal. For example: Refrigerator, freezer, microwave, oven and dishwasher with all doors open and close. A chalkboard surface is provided on the freezer for a quick write up or a shopping list. It also has a innovative speckled countertop design. With a very convenient storage space above the sink the child could store all the kitchen items in it during play. A perfect gift for someone you love. This farm tractor is a welcome gift for your toddler who gets excited looking you drive your car. It is going to be his first driving experience behind the wheel and cant explain how fun he is going to have. There are 2 variable speeds plus reverse; 2¼ & 4½ mph. (4½ mph lockout for beginners). The accelerator pedal gets the tractor to move and is also coupled with automatic brakes for stopping. Farm tractor wheels provide traction on grass, dirt, gravel or pavement. It has a working FM radio for some fun listening of music while your child is having a ride. Adjustable seat with flip-up armrests helps them position according to their height. This five seater or seating for two with a flatbed, covered storage & ride, an activity surface, XL storage & ride is a great play toy or ride on for you growing child.It has a expandable rear storage bag that folds away when not in use. The removable padded seat covers provide the extra comfort a child is looking for. Seat belts are provided for added safety. There are child and adult cup holders to sip on a drink while riding on. The handle folds over for easy storage. 10” Dura-Tred tires for a quiet ride. The UV protection canopy is removable when not needed. A fully white kitchen is not something everyone fancies. But for children with a bit of neat bug in them who wish to keep it clean can go for it as it does look very elegant. The doors open and close as it would in a normal kitchen. The appliances look very real replicating the actual kitchen. Oven knobs click and turn. The dimension of the assembled Product would be (L x W x H) : 33.00 x 13.00 x 35.70 Inches. It also has a cordless phone to chat on while cooking. The removable sink allows for easy cleanup. Looking for a sport to play indoors? Want some exercise combined with some fun? Here is the answer. This competition-grade table tennis table and net set is perfect for your home, office or community center. A Sturdy 5/8 inch (15 mm) wood composite surface provides for a consistent ball bounce. The 2 halves folds away separately for convenient and easy setup, solo playback mode and compact storage. Dual locking devices and four locking casters per half provides additional safety during transport and storage. It is very easy to assemble and can be folded any for storage in no time. This monster Traction system drives on hard surfaces, wet grass, and rough terrains to give an awesome experience for the driver. It has a maximum driving speed of 2.5 and 5 mph forward and 2.5 mph in reverse. Metal sidebars for hand support provide greater comfort and safety. Power Lock Brake System ensures added safety on all kinds of surface . Engaging a child is a challenging task on its own. Engaging them to do creative stuff is even more tuff. By doing this you can chanelize their energy into something more productive. Magna-Tiles is surely a winner in this area. It easily connects for hours of open-ended play. The child can create cubes, pyramids, and other geometric shapes. You can encourage your child to be creative with imagination, hands-on play to build anything you can imagine. It develops math, science, spatial and fine motor skills. It is a fun companion for children looking to be amused. This tiny little toy responds to voice commands and also reacts to famous Star Wars characters. It plays multiple games, holds beverages, and can also find and follow you wherever you go. The best part is that it moves along on its own. It is equiped with light beam, extendable utility arm and special secret features. In Game mode, R2 plays multiple games and spins, dances and plays music. It models a small holiday cottage or a home for a role play. It is perfectly designed for children to take part in all the chores of home and properly co-ordinate among each other to finish the tasks. Its Open design allows mom and dad to watch children while at play. it has a molded-in kitchen table, faucet, burner and other appliances. Accessories are not included and need to be bought separately. Adult assembly is required. This is a great gifting idea for children with extensive creativity. It comes with 1 Saige Doll and 1 Paperback Book.The Saige doll comes in an outfit that gets her creativity flowing! An indigo knit dress with cropped sleeves, geometric embroidery reminiscent of southwestern art, and a tiered skirt Tall leather-look boots with wrap straps A turquoise-colored ring to bring out her eyes, plus fun earrings. Blue cotton underwear.The Saige doll has a huggable cloth body, and her moveable head and limbs are made of smooth vinyl. It comes with a Saige paperback book that illustrates an engaging story that will inspire girls to act on their passions! This is a very modern looking kitchen with stainless Steel sink , Granite worktop, and Wood styling cabinets that provide incredible realism. It also has 5 electronic appliances like microwave, oven, stovetop, phone, and light. There are 7 cupboards and drawers for convenient storage. Oven, refrigerator, and microwave add to the storage. It is accompanied with a 37 piece accessory set that includes dishes, phone, and basket. All in all a complete kitchen to get start the cooking. Made from 100% plastic the Zoomer, is going to be your new real best friend who will bark, talk, scoot around, and play with you! This is a perfect piece of toy for kids who like to have pets at home. Just like a real puppy, he loves to learn new tricks. Teach him to speak, sit, lay down, rollover, shake a paw and more! Zoomer is so clever that he understands your voice in English, Spanish and French. Zoomer is made for children who can't wait to adopt a real puppy ages 5+. Zoomer can be recharged by using the included USB cable. This a miniature model of a passenger train. It is a great gift to give your child a experience with trains. It is a steam locomotive and Coal tender. Passenger coach has two opening doors. Observation car with "disappearing hobo" feature and opening door. There are three Polar Express figures (conductor, boy and hobo)to make it look more real. 12 Curved and 4 straight easy-to-assemble G-Gauge black plastic track pieces.It comes with a storage box to put away the tracks safely when not in use. It is controlled by a RC remote control. It makes authentic train and whistle sounds so that children can enjoy the actual experience. It has a working headlight. Handsomely detailed passenger cars feature fixed knuckle couplers. Remote control features clearly marked buttons that allow the user to make the train go forward and backwards. To sound the whistle, to ring the bell, and to play `All aboard for the Polar Express. While girls get to play with kitchen set, there is something for boys as well. A full fledged workshop. It is made from imported plastic material and is sturdy. Deluxe workbench with large work surface for the little builder who loves to work with their hands. it comes with a 50-piece accessory set that includes an electric drill, 2 drill bits, 8 screws, 8 nuts, saw, hammer, pliers, adjustable wrench, screw driver and 17 "wood" pieces. It has bins and jars for storage, spring action vise and pretend shop vac. Unique realistic-looking "wood" is made from indestructible Durafoam. It has realistic working overhead shop light and battery-operated drill with realistic sounds. A miniature of Tower bridge of London can be built with the set and can also simulate the London life by using the 4 miniature vehicles included in them. A black London taxi, a yellow truck, green automobile and even a traditional red double-decker bus say a lot about the London life. Tower Bridge is ideal for building and display - it can be taken apart in sections for easy transport. Features the iconic paired towers and a drawbridge that really opens and closes.4,295 Elements. A perfect ride on for girls with their fun character Dora and her friends. The maximum speed that can be achieved is 2.5 mph (4 kmh/H)and is within safety norms for a child to be on it. It has both forward and reverse motion. A foot-pedal operation is used for it . It has real working door for natural effect. It is a fun ride on tracks which takes the child through ups and downs to give a mountainous feel. There are two non-slip steps locked securely into a four piece track, while allowing for access from both sides.The detailing of Thomas the Train engine with an authentic face, decals and colours is so natural that the kid feels like he is actually riding on the real train. The fully assembled car has a high back, handrail and foot rests for a secure ride. With over nine feet of up and down riding track, the fun is endless. A cute lego model of a camper van can be built using the 3D imagination and creativity of a child. The exterior features include 11 windows, authentic plaid print fabric curtains and wing mirrors. The engine can be seen by opening the rear doors. Interior also features rear bench seat that transforms into a bed. It measures 11.8" (30cm) long and 5.5" (14cm) high. A total of 1,322 pieces is in this box. If you are planning a play date for your kids and expecting more children to turn up and looking for something that will keep them engaged for a bit, here is the one. This extra-large wooden wagon has a huge body for Maximum hauling Capacity. The removable wooden sides aids for easy in-and-out for children. Real air tires can handle any terrain. The extra-long handle folds under for easy storage. No-pinch ball Joint keeps fingers safe and controlled turning radius prevents tipping. We can guarantee that this wagon is a fun and safe utility for kids play around. This experiment kit is for slightly older children who are opening up to the world and looking to explore the things happening around them. It is built for Over 750 Experiments With 80 Parts. You will find all the parts included in the kit you would ever want to use. For example: Photoresist Or, Power Amplifier, Variable Capacitor, Analog Meter, Solar Cell, Computer Interface, and Full Color Manuals. Also includes Snap case 7 Heavy Duty Plastic Case With Custom Foam Inserts For Housing Your Snap Circuits Parts. Some typical experiments includes sound activated switch, lie detector, adjustable light controller, am radio, rechargeable battery and many more. Use your Windows PC and the included CI-73 Computer Interface manual converts your computer monitor into an oscilloscope and lets you see signals in process in the circuits you assemble. In totality we can describe this as a perfect gift for the blooming scientists. This is a Lego which has to offer more than just entertainment. It is filled with curiosity and creativity. Most important features include large CHI orb, waterfall, golden CHI, lion gate, drawbridge trap, hidden lion bikes, eagle fighter, cannon, tower, prison, and secret entrances. The most amazing of them of them all is of course Crawley's reptile raider features with rubber track and biting mouth; The weapons include 4 CHI weapons and 2 standard weapons.Some of the games you can challenge yourself with are slam the lion gate to spring the drawbridge trap and send Cragger plummeting; Aim the tower cannon and fire the shooter; Fold walls to store. Dare to play? If you are looking to engage your child during holidays with something creative, this is your answer. This pack of 1,500 pieces of puzzles is a clear hit among children. It has quick and easy system to pack away a part-assembled jigsaw, should the child wishes to return to it later. Separate construction tray is provided which is light and easy to move around. Four sort trays for display of unassembled pieces. A stylish, zip-up outer case makes your jigsaws easily portable. If you wish to travel across the world sitting at the comfort of your home with an interactive globe using digital geographic technology,Riplogle has an answer to it. A talking wireless reader delivers exciting educational facts about the various continents, countries, bodies of water, landforms, and more. You can also customise your hands-on geography lesson by downloading free online content onto the wireless reader using your USB port. You can then use it to play games, revise your geography sessions, compare structures. Audio is delivered in your choice of four languages: English, French, Spanish, and German. A classic instrument for a child who is developing a taste for music.It needs to be kept in a proper playing position with the included Fender strap when standing or sitting. The protective fender black nylon gig bag is included with the product. Under the natural glossy Basswood top, the time tested quartersawn X bracing adds to the distinct FA 100’s projection and top stability. You can enjoy an uniterrupted optimal playability through any season from the hex adjustable truss rod. A multipurpose unit which is a Workstation, storage and display unit all in one - creative play chest. it includes two building base plates. Building base plates fit on top of the unit and inside is the portable project cases. Raised edges at the top keep base plate secure for building or displaying creations. Portable project cases serve as filing system for sets or grab 'n go solution. A pool or lake propulsion vehicle for children or adults ages 8 and above. A perfect gift for children who would like to have some adventure in water. It propels the user at speeds of up to 2 miles per hour. The maximum depth rating is of 15.5 feet. Built for safety, with floating chassis, auto shutoff function, and protective grilles. waterproof circuit. Lightweight 12-pound body is easy to carry. An ideal gift for a child who would like to get messy. A Fully functional backhoe digger equipped with stabiliser foot and safety latch while the fully functional front loader can scoop up large piles of dirt, sand or snow. The tractor is pedal-powered, so no power system is required. The Front hood compartment lifts for real effect. Fully enclosed chain drive system for safety and oversized resin tires with rubberized tread for better traction. Two-position adjustable seat to be able to accommodate your children as they grow with roll-bar for added protection in the event of tipping. A clear hit among children is this lego which features 6 detailed floors with functions, to include folding staircase. It also has LEGO light brick palantir, opening entrance doors and a trap door. The alchemy room features 2 torches, a bomb, 2 potions, bottle, skull, gunpowder keg, pot, cauldron and a long axe. Adding to the creativity is the adventure bit to get through all the floors and reach the throne room. Saruman's throne room includes special features and entrance hall has trap doors. Attack the tower with the cool buildable and poseable.